The best thing that could be said about Baz Luhrmann's The Great Gatsby is that it's the sort of film that F. Scott Fitzgerald's characters would find terribly profound and moving, even though it's possible that no one else would. Using the same hyper-real and kinetic style that he employed to dizzying/disorientating effect in Moulin Rouge!, Luhrmann re-creates the Long Island playground of West Egg, home to the rich, beautiful and carefree denizens of an America drunk on success and illicit booze. It's a world of empty pleasures and idle existences, populated by people whose greatest concern is where their next good time is going to come from. Into this soused Eden stumbles Nick Carraway (Tobey Maguire), a Midwestern naif intent on making his fortune as a bonds salesman in New York. 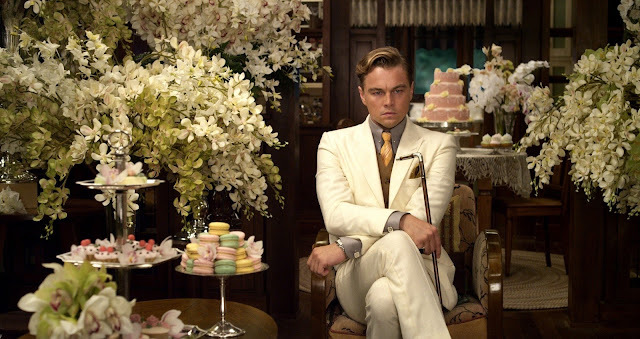 He soon finds himself drawn into the decadent and opulent lifestyle of his neighbour Jay Gatsby (Leonardo DiCaprio), a multi-millionaire, at a time when they were in relatively short supply, whose house is constantly thrumming with revelers in attendance of a near constant string of parties. It's a brash and exhilarating lifestyle, but also a hollow one. Gatsby never lets anyone into his life, and he spends his days gazing out at the green light across the bay which marks the East Egg home of Tom and Daisy Buchanan (Joel Edgerton and Carey Mulligan). Daisy is Nick's cousin, but she also happens to be Gatsby's great love. Nick finds himself playing Cyrano de Bergerac for the couple, but it isn't long before desire, money and secrets threaten to tear them asunder. Baz Luhrmann is not a man of half-measures; when he commits to something, he throws his whole being into realising that one thing as fully as possible. As such, his films have a tremendous energy behind them that, depending on how you feel about his style, is either hugely intoxicating or amounts to a lot of sound and fury, signifying nothing. When The Great Gatsby works, it's usually when Luhrmann's whirling dervish quality is focused on the extravagance of Gatsby's lifestyle, because it amounts to putting a great amount of effort into creating something completely empty. If Gatsby is hosting a party, then it will be the most riotous and opulent party ever staged. If he is going to drive, he is going to do so in style and dangerously quickly. If he is going to pursue Daisy, he is going to do so to lavish effect. In Luhrmann-land, there is no such thing as too much. All of these accoutrements are conjured up through the magic of CGI, which no doubt raised the hackles of literary purists, but actually feels oddly appropriate for the story. There's a weightlessness to CGI that fits Gatsby's lifestyle; the mansion and the parties are meant to be ephemeral and false, and Luhrmann's West Egg feels aptly unreal because it is, in both a literal and metaphorical sense, not actually there. As the camera floats through an imagined version of 1920s Long Island, it conjures up a nostalgic image of an America that no longer exists, but which didn't even exist at the time, which would cast a pall over the frivolity if the camera didn't cut to some other outrageous thing immediately. The soundtrack is also so bizarrely counter-intuitive that it ends up making some twisted sense. The film is awash with 1920s-style versions of contemporary pop hits from the likes of Amy Winehouse, Beyonce and U2. The production makes sure that the songs fit the era but, with few exceptions, they don't seem to offer a particularly strong commentary on the action. In fact the songs that best fit the film are unreconstructed hip-hop tracks from Jay-Z and Kanye West, men who have made themselves incredibly wealthy by rapping about the hollowness of being incredibly wealthy. Flappers jitterbugging to "No Church in the Wild" sounds like a disaster waiting to happen - and the film very gingerly walks the line between triumph and catastrophe every time a song gets cued up. Yet, unlike Gatsby, it somehow gets away with it in the end. The look and sound of the film point to Luhrmann's great strength and fatal flaw as a filmmaker; his often painful literalism. The frequent use of the actual text of the novel - which is being written by Nick as a memoir in a rather clunky framing device - onscreen should leave no one in any doubt of that particular tendency. The music choices are very ostentatious, and are geared to making sure the audience is in no doubt as to how they should be feeling at any given moment. That kind of bravado can be alluring in short bursts, but over a couple of hours it can get incredibly grating. His commitment to recreating the world of the novel as literally as possible is impressive, and results in a film which looks incredible, but he struggles to get at the heart that lies beyond Gatsby's trappings. There's a general sense that Gatsby is sad, and that he is meant to be the apotheosis of the American Dream, or at least a satirical vision of the American Dream, but there isn't much to the film beyond that vague idea that something is happening. Any depth the film finds comes largely from the actors, who give performances which nicely balance the need for them to be both cyphers through which the time period can be experienced, and real people the audience can care about. Maguire plays Nick's naivete convincingly, particularly his debauched wonder at the world around him, and Mulligan manages to capture the sense that Daisy is both a real, achingly sad woman trapped in a loveless marriage and an ideal that Gatsby longs for because he believes it will complete him. DiCaprio is undoubtedly the star, and his celebrity charisma is perfect for Gatsby; both men have an allure to them that is undeniable, yet both clearly harbour darkness beneath the veneer of glamour. The relationship between Gatsby and Daisy ultimately feels pretty bloodless, but that isn't the fault of either Mulligan or DiCaprio, but rather the airlessness of the film around them. The Great Gatsby has all the fizz of champagne and is about as nourishing. It's a very superficial treatment of a story that has a lot of thematic resonance, but as superficial experiences go it's a lively one. Visually astounding, narratively lumpy, it's probably the least stuffy adaptation of a Great Novel imaginable, though it does seem to have jettisoned most of the substance along with the sense of importance.